We are in the 21st century? The USA is a “modern” country? A midwest state, with four distinct seasons and no permafrost should be considered civilized, right? Certainly not backwoods Alaska? Well, then. The only reason anyone is using “quick” road paving methods anymore is MONEY. 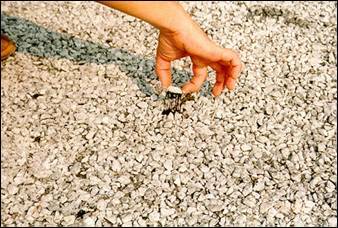 The marketers of such “chip seal” paving, and most state DOT’s all hail chip seal as improved road maintenance. Car owners, however, should be outraged. Why the silence? Do you enjoy driving down a perfectly good road on your way to work, only to find that on the way home, the same road has been freshly coated with a layer of liquid asphalt and loose gravel?! 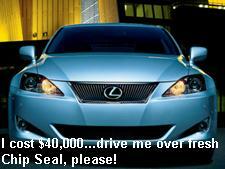 With most new vehicles costing upwards of $20,000, this should be a legal slam-dunk. Would you tolerate it if someone threw gravel at your car from a freeway overpass? Oh, no, THAT is illegal! First add some TAR, then all is forgiven.